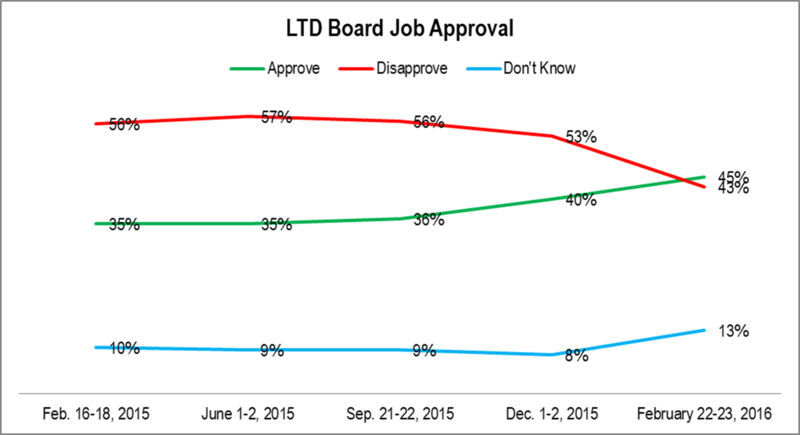 The LTD Board’s rating took a sharp upturn earlier this year after being steady for a long time. The “Don’t Knows” increased at the same time. 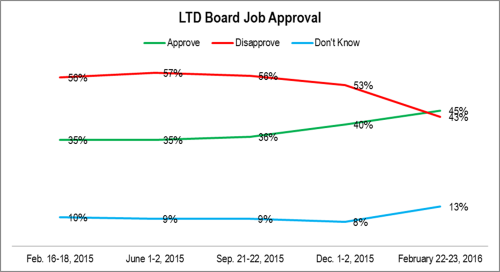 QUESTION: How would you rate the job the Lane Transit District Board of Directors is doing: excellent, good, fair,poor? METHODOLOGY: 200 live telephone interviews of City of Eugene likely General Election voters were conducted February 16-18, 2015, June 1-2, 2015, September 21-22, 2015, December 1-2, 2015, and February 22-23, 2016. 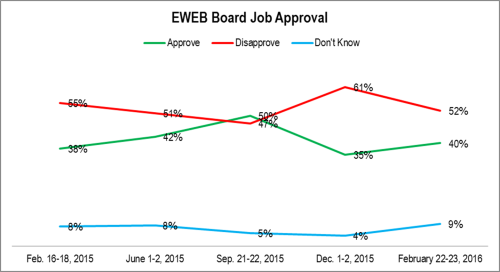 The margin of error at the sample median is 7%. The total might not equal 100% due to rounding. The EWEB Board’s rating looks like it is returning to its long-term level after a detour December 2015. METHODOLOGY: 200 live telephone interviews of City of Eugene likely General Election voters were conducted February 16-18, 2015, June 1-2, 2015, September 21-22, 2015, December 1-2, 2015, and February 22-23, 2016. The margin of error at the sample median is 7%. The total might not equal 100% due to rounding. 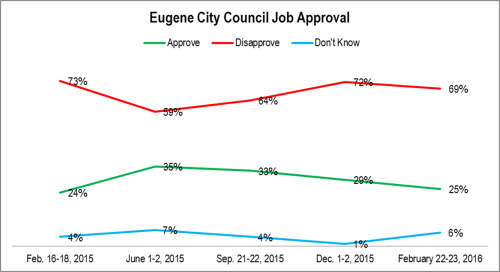 Although there was a significant improvement the middle of last year, Eugeneans opinion of their city council has returned to its common low level. QUESTION: How would you rate the job e Eugene City Council is doing: excellent, good, fair, poor? 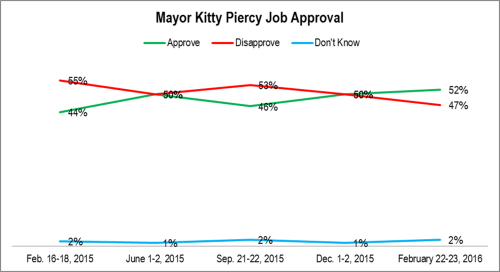 Mayor Piercy’s job approval took an uptick early this year. 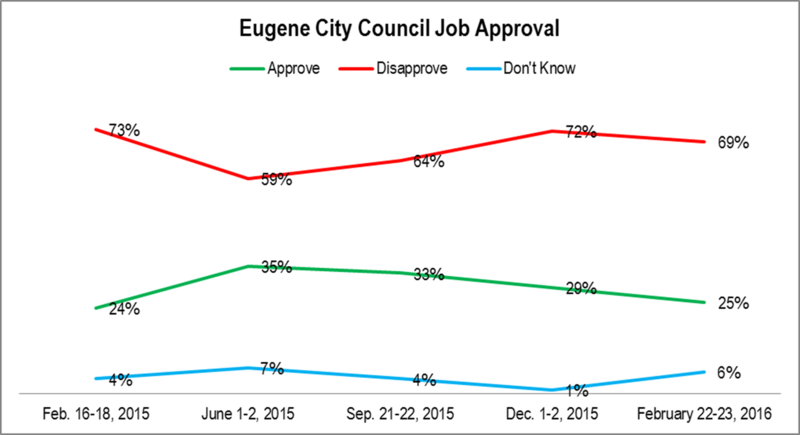 Long-term, it’s been hovering around 50% for years – reflected how divided Eugene is. 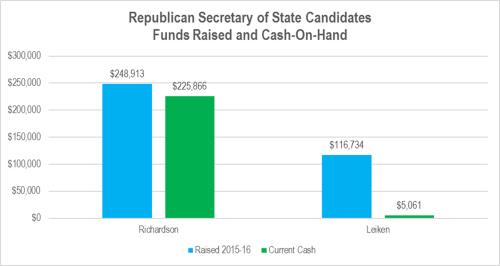 In the Republican Primary for Secretary of State, Dennis Richardson has a huge fundraising edge over Sid Leiken. This edge is magnified by the more than 95% burn rate of the Leiken campaign compared to the under 10% Richardson burn rate. The result is that Richardson’s reported cash on hand is nearly 50X what Leiken has. METHODOLOGY: Funds raised equal the total raised during 2015 and 2016. Data from ORESTAR collected afternoon of March 12, 2016. In the Democratic Primary for Secretary of State, Richard Devlin leads with Brad Avakian second, and Val Hoyle trailing. Listing the cash raised would have been misleading because Hoyle’s legislative leadership artificially magnifies her funds raised and, consequently, here implicit burn rate. This role also has hampered her fundraising. METHODOLOGY: The cash is from data on ORESTAR collected afternoon of March 12, 2016. 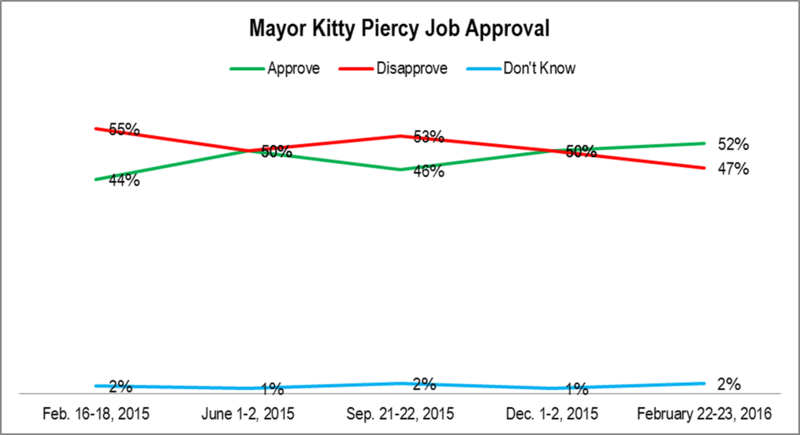 In the race for Governor incumbent Kate Brown has a massive edge. Pierce’s fundraising has crossed the million dollar mark. Alley’s campaign, basically a week old when these data were collected, has been making rapid progress.. It is striking that only three of ten campaigns report really getting going at this point. Clearly, while the presidential primary campaigns have moved forward, Eugene’s campaigns have barely started. METHODOLOGY: Data from ORESTAR as of afternoon Saturday, March 5. Values rounded to nearest dollar. To date, only Wig and Skor report active fundraising. Both were very active in 2015. To date, Vinis is the only one of the four candidates to report active fundraising. It is worth noting that the Clark campaign appears to be delaying reporting as long as possible – a one month lag. Therefore, one would expect Clark to begin catching up in the coming days and weeks.